This frame is absolutely gorgeous!! It is quality made and shipped in excellent protective packaging. 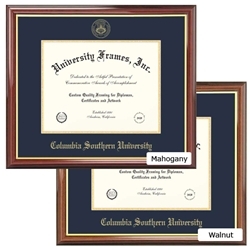 Custom frames are very pricey, but I think this one is actually a bargain since it's made specifically for the CSU diploma. I'm very happy with this product and highly recommend it to anyone with a CSU diploma.